This weekend is Greek Fest in Chicago….Lincoln Park Greek Fest to be exact. My friends asked me to go, but I’m busy packing for my Scandinavia trip! I leave tonight and couldn’t be more excited. Greece was one of the most beautiful places I have ever traveled to! Never in my life have I see such bright blue and turquoise water. I spent a week in Athens, Santorini, Oia and Mykonos with one of my closest friends and we had a blast! We sailed around the gorgeous island of Santorini, laid on the white sandy beaches in Mykonos and raced around Athens to find the famous Poet Sandal Maker. Although I’m missing Greek Fest this year, it was great to go back in my photo albums and pull up some of my favorite photos of the trip! Enjoy the pics below and enjoy Greek Fest for all my fellow Chicagoans! It’s very cold in Chicago right now so I’m happy to report that I’m gettin’ the heck out of here and going to Cancun!! I recently got an amazing new job, and a company-wide 2014 kick-off in Cancun is just one more perk! After all the hobnobbing and work presentations I’m hoping for at least one day at the beach, but I know it won’t quite be the same as my first trip to Mexico. In 2010, my sister and I took our second “Sisters Trip” to Riviera Maya, Mexico. It was the first time we had been to Mexico and the first time either one of us had stayed at an all-inclusive resort. We had a blast at the Ocean Maya Royal resort and immediately headed to the activities desk to view all the suggested adventures. Options included an all-day tour of Chichen Itza (Nope, that was already booked on our own prior to arrival), Swimming with the sharks (Hell No!! Are you crazy?) and Snorkeling with Sea Turtles (Duh! Sounds amazing, sign us up!). We booked the tour and had an incredible time snorkeling for the first time, in clear shallow waters, with a handful of sea turtles. 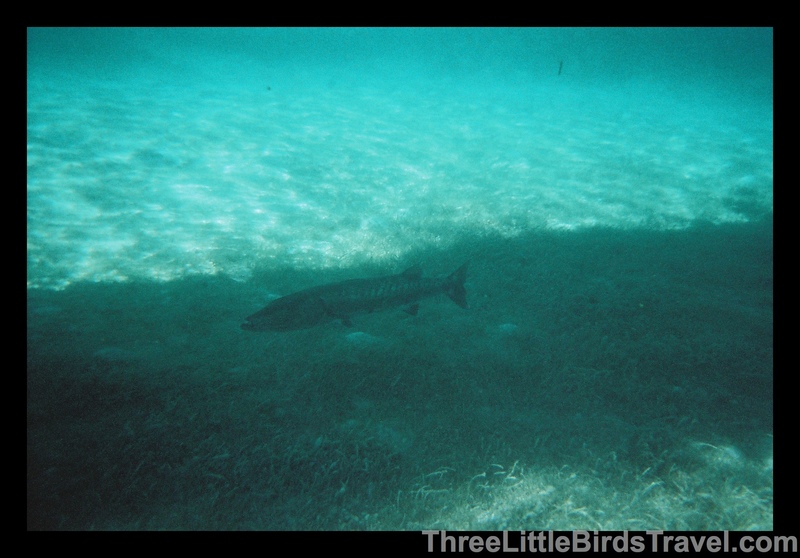 All was going just perfectly until we saw it…a GIANT, SCARY, BARRACUDA!!!! AHHH! Scary Barracuda wanting to eat us, probably. Luckily it stayed right under a mid-sized boat the whole time, but I sware if the turtles weren’t there it would have had us for lunch. Seriously. Alright, now for some less-scary pictures of the beautiful and peaceful sea turtles! I didn’t have my go-to Sony RX100 Camera, but I think the inexpensive underwater camera captured some really great shots! If you ever see this type of activity as an option while vacationing, I strongly suggest you sign up! Enter your address to follow this blog and receive notifications of new posts by email. Three Little Birds Travel is all about inspiring you to wake up and explore this amazing world...like a local of course! Through smart traveling tips, custom guides and stories of my own personal adventures (some with my big sis), you'll be compelled to start a journey of your own, with confidence! Want more ways to get involved? Join my Pinterest or Twitter pages. Need a quick shot of really smart travel advice? Check out my 14 Travel Tips for 2014 Blog post. Trdelnik – Cinnamon and sugar goodness! Turkish Coffee with Turkish Delight! "We are to Dedicated to a BETTER YOU"
Follow me while I eat, drink and travel my way through life.